In the beautiful Blue Ridge Mountain piedmont area of Western North Carolina, this property has "celebrity grade" privacy and security, yet has convenient access to airports, highways and urban areas. This large property presents both an investment in the future and a legacy for generations to come. Centrally located on the Eastern Seaboard of the United States and conveniently accessed from New York, Florida and Washington, DC, this estate is truly a strategically located world unto itself. It is nestled in the protective foothills of one of the most beautiful and protected natural locations in the country. This property is also close to the desirable business centers of Raleigh, Durham, Chapel Hill, Research Triangle Park, and Charlotte, North Carolina. CLICK here for a MAP. For maximum privacy the residence is located in the geographic center of the property with a winding, scenic driveway leading to the home. This lush and tranquil area of low population is free of hurricanes, tornados, earthquakes, floods, landslides and wildfires. Within the residence hidden secure storage provides concealment for valuables in addition to protection by the security system . The local airport is 15 minutes away and accommodates larger corporate jets with complete facilities. Charlotte (CLT) and Greensboro (GSO) are the closest international airports. The option of your own airstrip exists as there is ample clearing for a runway in the valley East of the residence. And there is a site ready for a heliport within 200 feet (61 m.) of the residence. 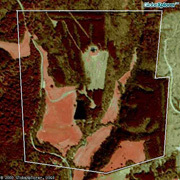 The property is approximately 15 miles (24 km) East from Interstate 77, the major North/South highway. Charlotte, North Carolina is one and a half hours to the South. Winston-Salem, North Carolina is 45 minutes to the East. Charlotte, the second largest banking center in the United States, is an hour and a half to the South. Winston-Salem and Greensboro are to the East as are Raleigh, Durham, Chapel Hill and Research Triangle Park. Roanoke, Virginia is two hours to the North. 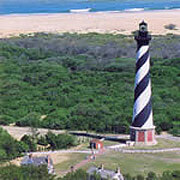 The North Carolina coast is arguably the most beautiful stretch of beaches and barrier islands on the entire North American coast. The natural beauty of the area is just three and a half hours via excellent freeway from your door. The Blue Ridge Mountain area of the Appalachian Range is literally your backyard. These mountains range in height up to 6,000 feet (1,829 m.) and are a 15 minute drive from the property. Full service campgrounds, restaurants as well as more primitive experiences can be found throughout the region. In addition, these mountains have a protective role as well: shielding the entire region from the more severe weather that blows in from the Great Plains.